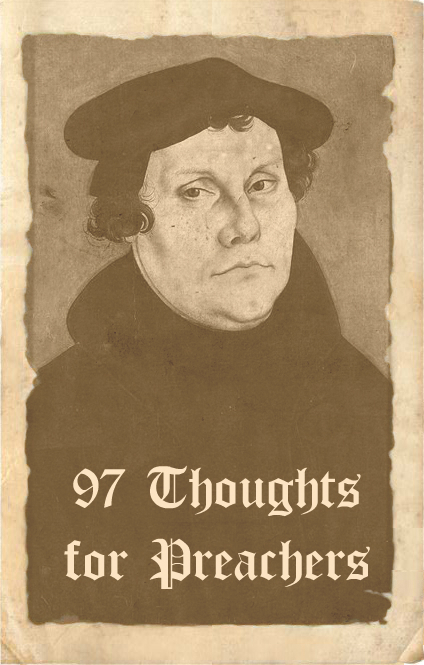 We are now into the second half of this series of posts on Luther’s 97 Theses. You will probably need to read the earlier posts to make sense of the series, but more than that, I’d suggest you read the theses themselves. 41(-42). Virtually the entire Ethics of Aristotle is the worst enemy of grace. This in opposition to the scholastics. These snippets should make you want to read more of Luther. I wonder how much we tend to blend common sense or philosophy with biblical revelation? For some, this kind of provocation might make us go back and ponder our blending of natural reason with biblical revelation in respect to our preaching. For others, it might make us want to take stock of our entire theological education and library! Luther is certainly provocative. In those days everyone studied Aristotle as a staple in their theological training. These days most don’t take classes in Aristotle’s work, but has his influence shaped anything which we do study in formal theological training? 45-49 – Luther goes after an essentially idolatrous lauding of the human mind. There is something strangely magnetic about taking pride in human intellect. As preachers lets be careful not to treat intellectual pride as somehow more acceptable than other sins. This kind of statement prompts me to ponder just how profound the Fall of Genesis 3 was for humanity. Our best and brightest analyst of human life, from Luther’s perspective, was at the opposite extreme from light. How easily does our perspective automatically assume it has light when it is really still in darkness. As preachers, we need to pray for real clarity lest we promote darkness unawares. 51-53 – Luther knew his history and knew that some influences in the history of the church have been downright dangerous. Some preachers live under the impression that anything old and known must be good and helpful. Let’s pray for discernment. Part 7, coming up . . .
Keep ’em coming — I don’t really have anything to add, but I’m finding this series very thought-provoking and helpful.